The EU funded EuroMed Transport Support Project, in cooperation with the Ministry of Transport of Jordan, organizes a National Workshop on Conventions on Road Traffic and on Road Signs and Signals, of 1968 (Vienna Conventions). The Workshop will take place in Amman on 16-17 April 2019 and aims at presenting the main provisions and benefits of these Conventions, as well as promote their implementation. Among the distinguished speakers is Mr. Robert Nowak, Head, Road Transport and Road Traffic Safety Unit & Secretary, Global Forum for Road Traffic Safety (WP.1), Sustainable Transport Division, United Nations Economic Commission for Europe (UNECE). The Conventions on Road Traffic and on Road Signs and Signals, of 1968, contain the rules of the road that have to be complied with by all road traffic components. The Convention on Road Traffic, of 1968, contains rules related to all road traffic issues, including infrastructure, all kinds of wheeled vehicles, rules of the road of road traffic, as well as road users including pedestrians, cyclists and drivers. The Convention sets up: conditions for the admission of motor vehicles and trailers in international traffic and for their registration; distinguishing signs and identification marks of vehicles in international traffic; and rules concerning the issuing of domestic as well as international driving permits. Rules of the road include such issues as: position of vehicles in the carriageway; overtaking; speed and distance between vehicles; change of direction; rules applicable to pedestrians; behavior of drivers towards pedestrians; etc. By addressing the main factors of road accidents, including behavior in case of accidents, these rules are essential for enhancing road traffic safety and efficiency. This is applicable to national but also to international road traffic, since these rules provide a harmonized international road traffic system. 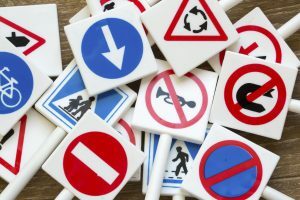 The Convention on Road Signs and Signals, of 1968, contains general provisions on road signing and specific rules on rules on road signs, traffic light signals as well as road markings, including a color reproduction of signs, symbols and panels. The Workshop agenda, presentations and other background documents can be found here.